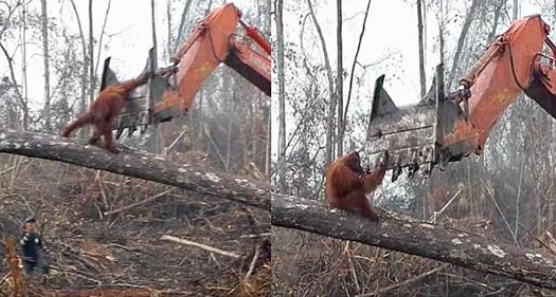 Heartbreaking footage of an orangutan trying to fight off an excavator from destroying his home highlights the terrible plight these gentle apes are facing. “This desperate orangutan is frantically seeking refuge from the destructive power of the bulldozer; a machine that has already decimated everything else around him,” writes International Animal Rescue, who released the video for World Environment Day. This dramatic footage shows the devastating impact deforestation is having on precious orangutan habitat. Orangutan habitat is being decimated at a staggering pace due to illegal logging or palm oil production. The apes are often subjected to cruel and barbaric torture or killed in order to make way for human developments. An increasing number of orangutans are being orphaned. Many are rescued by IAR, but even more are lost. As result of human activities, studies suggest that more than 2.5 million acres are lost every year. As a result, orangutans are left to starve and die with nowhere to call home. Borneo orangutans are now considered critically endangered. International Animal Rescue is asking for help through their Plant A Tree initiative to help reforest the orangutans’ forests. 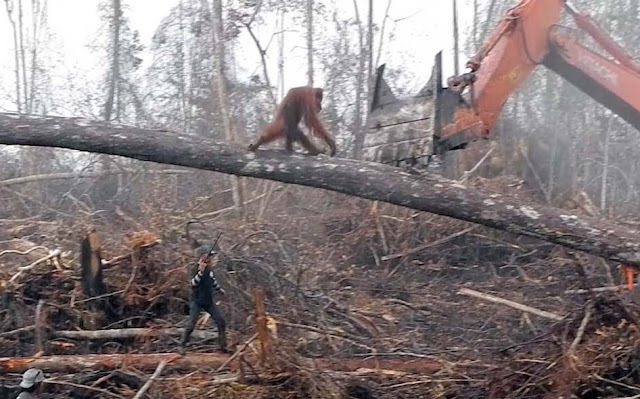 Responses to "Orangutan Tries To Keep Excavator From Destroying His Home"
Horrible,tragic,and just plain SAD!This is THEIR HOME!!! Not ours! PLEASE, STOP!! !